Eating in season has plenty of advantages. Asparagus is but one of them. When the season hits, one needs to sink their teeth into all the green, indescribable flavor that baby asparagus stalks have to offer. When in doubt whether the dish feels complete or not, take the freedom to add a sprinkle or two of sesame seeds, for a little bite of crunch and whole lot of punch. Asparagus and steak are best friends, they always compliment each other and they do make a cute couple. We aren’t saying to play with your food, but if you play on the fact that some things just taste great together, you will want to make this dish two or three days in a row, because it is fun and unbelievably simple to prepare. Plus, asparagus may just be one of the best foods on the planet! It has plenty of vitamin A, C, E, K and B6, as well as folate, iron, copper and calcium. You may even want to buy an extra bunch of baby asparagus and grill them straight on the side to splurge on your health and wellbeing in the short growing season. If the steak rolls are an appetizer, go ahead and dig straight in; if they are part of a more complex meal, then we suggest an appetizing soup to start, such as the delightfully surprising turnip, potato and pear soup or the slow cooker sweet potato soup. 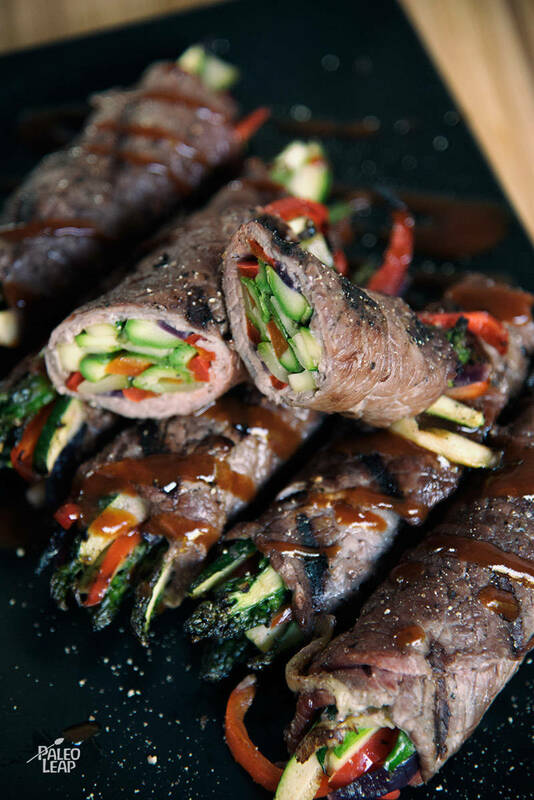 For a variation on the theme of vegetables rolled up in steak, especially if you are aiming to eat in season, you may consider making Balsamic Steak Rolls that are full of matchstick sliced carrots, rather than baby asparagus. Heat olive oil in a skillet over medium heat. Add the garlic and cook 1 to 2 minutes or until fragrant. Add all of the thinly sliced vegetables, season to taste and cook until softened, 4 to 5 minutes. Place some of the vegetables in the center of each slice of beef. Tightly roll the meat around the filling, and secure with a toothpick. Season each beef roll to taste with sea salt and freshly ground black pepper. Grill the beef rolls, 2 to 3 minutes per side.